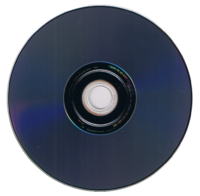 HD DVD (short for Heich-Defineetion/Density DVD) is a discontinued heich-density optical disc format for storin data an heich-defineetion video. Supportit principally bi Toshiba, HD DVD wis enveesioned tae be the successor tae the staundart DVD format. In Februar 2008, efter a protractit format war wi rival Blu-ray Disc, Toshiba abandoned the format, annooncin it na langer developed or manufactured HD DVD players or drives. The HD DVD physical disc specifications (but nae the codecs) wur still in uise as the basis for the Cheenae Blue Heich-defineetion Disc (CBHD) formerly cried CH-DVD. The HD DVD Promotion Group wis dissolved on Mairch 28, 2008. Acause aw variants except 3× DVD an HD REC employed a blue laser wi a shorter wavelength, HD DVD stored aboot 3.2 times as much data per layer as its predecessor (maximum capacity: 15 GB per layer instead o 4.7 GB per layer). ↑ 1.0 1.1 Moses, Asher (February 20, 2008). "No refunds for HD DVD early adopters". Melbourne: The Age. Retrieved 2008-02-24. This page wis last eeditit on 26 Julie 2013, at 03:43.